SEGA Europe has revealed a brand spanking new trailer for Team Sonic Racing, this one being called ‘Team up’, giving you a overview of all the information we’ve been given the last few months including a overview at a bunch of race tracks. I will say that the game has been looking better and better each time they show it, but something about the game still turns me off. Maybe because one of the reasons I liked the All-Stars Racing series was because of all the fan service while this game is playing it more safe. I guess we shall see if it works out for SEGA. Apple’s newly announced streaming game service Apple Arcade features titles from a variety of studios and developers, and unsurprisingly SEGA is one of many on the list. SEGA has long been a supporter of Apple’s mobile game services, with Super Monkey Ball being an App Store launch title. Now, SEGA will be bringing Team Sonic Racing to mobile with Sonic Racing as a launch title for the service when it debuts this fall. With the “Team” dropped from the title, we have to wonder if the game will lack the team mode which is the backbone of the console version. Interestingly, this also makes the previously leaked 3D ChuChu Rocket mobile game more of a legitimate possibility. Both games appeared as Facebook ads earlier this month. More information as we hear it! Sonic @ SXSW: Team Sonic Racing: Overdrive 2-part animation announced – watch part 1 now! The Sonic panel at SXSW had a surprise for fans of animation and modern Sonic by way of two new animated shorts! Titled Team Sonic Racing: Overdrive, the animations are created by the same creative team as those behind Sonic Mania Adventures. Based on the audience and online reaction, the first short was a hit and fans can’t wait to see the second. It’s great to see some of the same creative marketing used for Sonic Mania applied to Team Sonic Racing. What did you think of the new animated short? Sound off in the comments below! BEEP, BEEP! Team Sonic Racing is coming through with a new customization trailer showing how far you can customize your favorite characters. Quite frankly I’m very happy we are finally getting to the single player, unlockable content. I really believe that SEGA & Sonic All-Stars Racing Transformed was a much better game due to its single player content. While this is only customizable stuff, its nice that have things to unlock and customize. What are your thoughts on the trailer? Team Sonic Racing hits PlayStation 4, Nintendo Switch, Xbox One and PC! on May 21, 2019! Hidden Volcano is a lava zone course hidden deep within the ice-covered Glacier Land area. This area is distinguished by its lumps of ice created by the scorching hot magma within the iceberg and complicated terrain due to lava rocks. It requires calm judgment and bold technique to conquer its slippery ice roads and varying bumpiness caused by tears in the earth. At the starting line, a lava giant towers above the track and swings its fist downward to block the racers’ path forward. Check out screenshots of the game below. What do you think of the brand new Hidden Volcano track? When Sonic & All-Stars Racing Transformed released, it hit nearly every platform under the sun. The upcoming Team Sonic Racing, meanwhile, was seemingly holding back as the team at Sumo Digital focused on one version of the game. 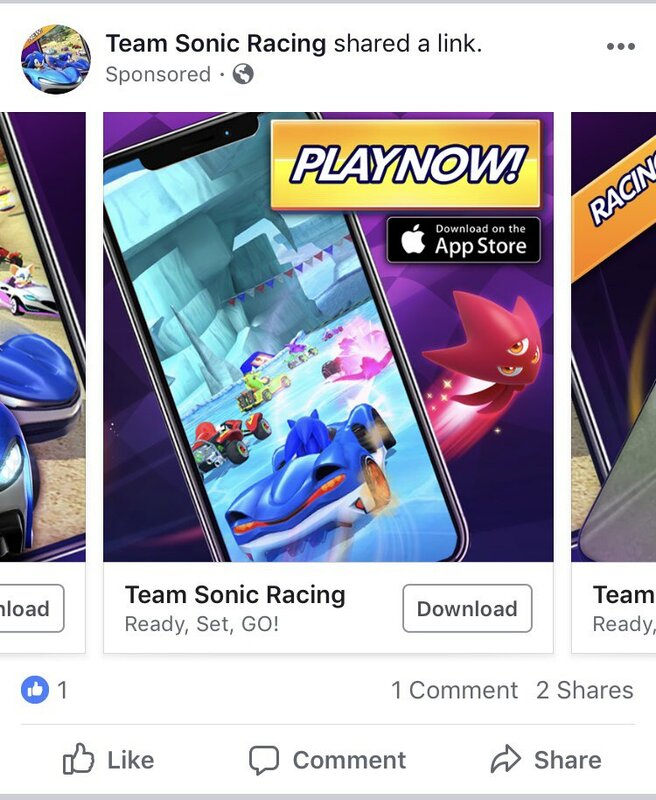 However a recent Facebook ad that several fans have encountered, including Twitter user Radiant Emerald who we’re citing, features screenshots of a mobile version of Team Sonic Racing. Little is revealed outside of three screens and an app icon. It makes sense that SEGA would want a mobile version of the game, as it has been the norm with the previous All-Stars Racing games as well as Sonic Forces which saw a Sonic Dash style game. The question is, will this mobile version be a direct port of the game right down to all the tracks and racers? Or could we be seeing a stripped down version, potentially on rails like Sonic Dash? We should know more, potentially during the Sonic panel at SXSW which will be held on March 16, 2019. The Sonic the Hedgehog social media page has uploaded a new video showcasing a behind the scenes look of the music being composed for Team Sonic Racing featuring Sonic the Hedgehog music veteran, Jun Senoue and many other musicians. The video features sample tunes of many tracks such as Boo’s House, Frozen Junkyard, Market Street, and Green Light Ride. As this is part 1 of Making of the Music for Team Sonic Racing, it would be cool to see Tee Lopes and Hyper Potions at work on video for part 2. Like the music for Team Sonic Racing? Let us know on the comments below. The final(?) team has been announced for the upcoming Team Sonic Racing! Team Eggman brings togehter Eggman, Metal Sonic and… Zavok? On this SEGA News Bits, George and Barry discuss the newly formed team, how the roster looks and what else has been announced for the game in the past week. We’ve known for a while that Eggman would have his own team in Team Sonic Racing, and now we know who decided to accept his invite. Team Eggman will consist of Eggman, Metal Sonic and Zavok, the leader of the Deadly Six from Sonic Lost World. Zavok is an interesting choice. 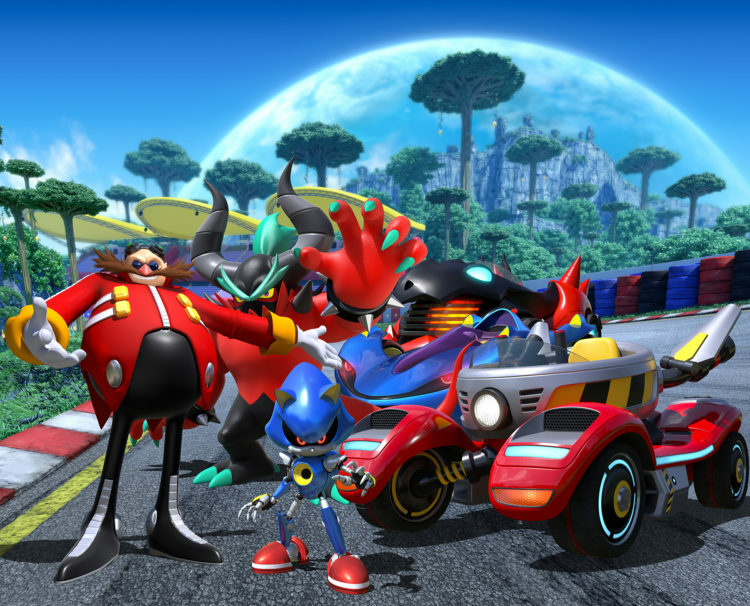 There are other baddies from Sonic’s recent history that SEGA could have pulled from, like Chaos or Infinite, but when you think about it besides those two and the Deadly Six you’re left with badniks or giant monsters that are way too big for a car. Zavok has made appearances in Super Smash Bros. for Wii U as a trophy, in Sonic Runners during a special event, in Mario & Sonic at the Rio 2016 Olympic Games, in Sonic Forces: Speed Battle and in Sonic Forces as an illusion created by Infinite. Personally I was hoping for a modern redesign of Fang in his sweet hover bike, but I know that’s not happening. Team Sonic Racing releases May 21, 2019. Pre-order Team Sonic Racing today! SEGA has announced a new track and released a sample of a new tune for the upcoming Team Sonic Racing. It has been previously revealed that the game will have a mix of new and returning tracks, and this time we have Ocean View from Sonic & All-Stars Racing Transformed (based on Ocean Palace from Sonic Heroes). To accompany the track is a remix of a familiar tune by Jun Senoue who has partnered with artists Richard Jaques & S.A.M.E. You can listen to the remix of Sonic CD‘s “You Can Do Anything” above. In the comments below, let us know what you think of the track and tune! Here’s a nice pick-me-up after the awful Sonic the Hedgehog movie reveal news from earlier this week! Next year’s Team Sonic Racing will feature a desert track called Sand Road which is a nod to Sonic Adventure‘s Sand Hill. The track will feature music from Tee Lopes and Jun Senoue, which is a new take on the classic Sand Hill music. Overall it looks and sounds very cool. 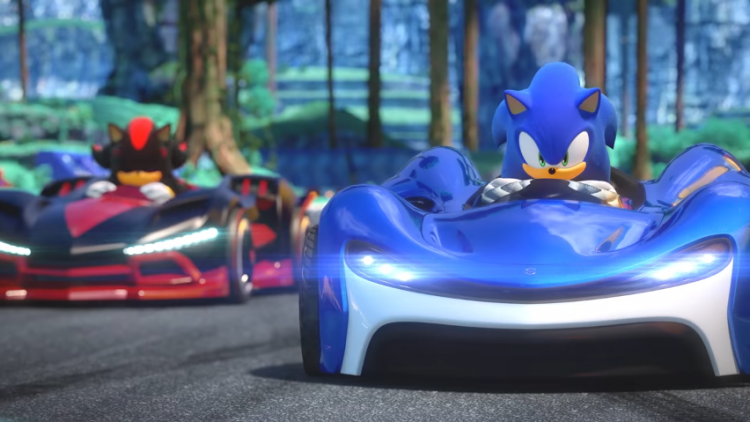 It’s clear that SEGA’s postponement of Team Sonic Racing is for the best, and these drip feeds of music and track reveals are a great way to keep fans excited before the game’s release. Tokyo Game Show 2018 may have been back in late September, but SEGA has just nows released a video from the event sitting down with Sonic Team head Takashi Iizuka to discuss the upcoming Team Sonic Racing. Iizuka talks about the inspiration for the team gameplay, the music and more! For those who missed the news, the game has been delayed to May 21, 2019 and it appears Sumo Digital is still hiring track and vehicle handling designers meaning the game is still very much in active development and there is a concerted effort to make the game the best it can be. Team Sonic Racing track reveal scratches that fan service itch – enter “Boo’s House”! We’ve been a little hard on Team Sonic Racing here at SEGAbits, but we do so out of love. 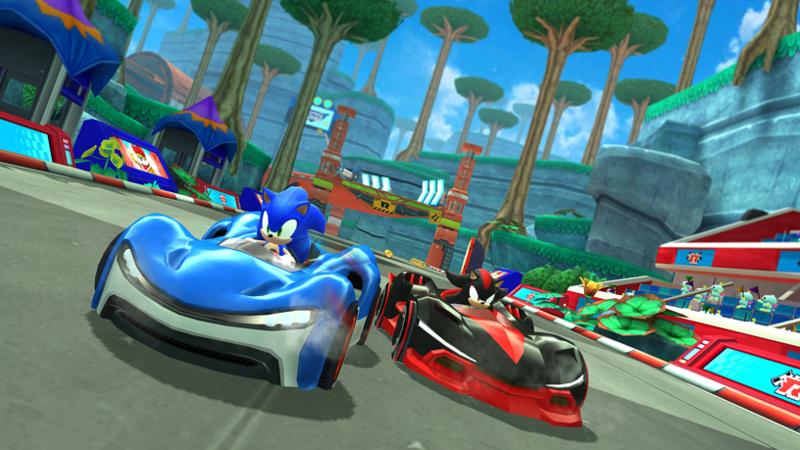 Following up from the great Sonic & SEGA All-Stars Racing and excellent Sonic & All-Stars Racing Transformed, Team Sonic Racing felt a little flat. In dropping the other SEGA characters and making it Sonic-only, I felt that SEGA really needed to go the extra mile to appease fans. Go nuts with the callbacks to Sonic’s racing past, feature long lost characters like Fang, give us tracks that mash-up classic and modern eras. Unfortunately, from what we’ve seen the roster is limited and the tracks feel pretty basic. Thankfully, with the announcement of a delay to May 2019, we could see a little more TLC put into the game and today’s reveal just might be an indication of that. Released on the Sonic social media accounts is a preview of the music from a new track “Boo’s House”. 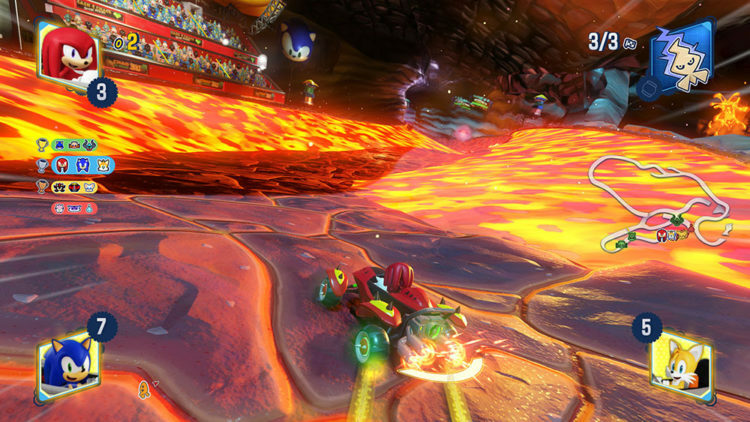 What’s great about the track design is that it evokes Sonic 3‘s Sandopolis and Sonic Adventure 2‘s Pyramid Cave. The track is home to Sonic Adventure 2‘s boss King Boom Boo and the music is a remix of Sandopolis by Tee Lopes & Jun Senoue featuring Tei Sena on violin. Suffice to say, this reveal makes me very happy and I hope we see this level of fan service applied to other tracks in the game. It has finally been confirmed that Team Sonic Racing won’t be hitting this holiday season, instead we will have to wait until May 2019 to get our hands on the upcoming Sumo Digital Sonic the Hedgehog themed racing game. On this episode of the SEGA News Bits we discuss why it might have been delayed, what they can do with the extra time to get Sonic fans more excited and more! Hey guys! To make Team Sonic Racing the best game it can be, we’re giving the team extra time to work on it. Our new release date is May 21, 2019. We know delays are no fun, but quality matters most. Thanks for your patience – we’ve got more to show you for TSR very soon! It feels to me that this could be a good idea if this actually means we are getting a better game for it. Quite frankly, I’m pretty sure that Team Sonic Racing might have not have done too hot this holiday season with big titles like Super Smash Brothers Ultimate, Red Dead Redemption 2, and Fallout 76 coming soon. What are your thoughts on the delay?